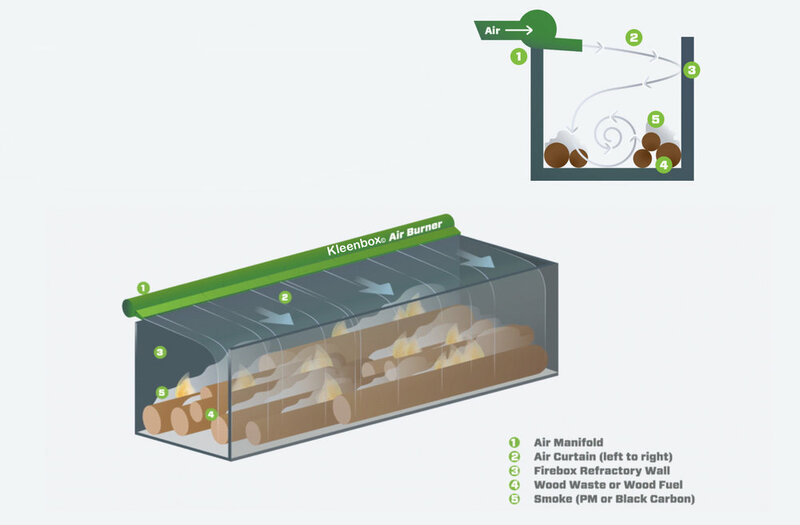 The primary purpose of the air curtain is to create a "secondary burn chamber." The air curtain is like a lid covering the opening in a FireBox. The particles of smoke rising on the hot gasses of the fire are trapped under the air curtain. These smoke particles are then reburned and their size is significantly reduced. With this reduced size, they can now escape through the air curtain and appear more like waves of heat than smoke. The result is a very clean burn. 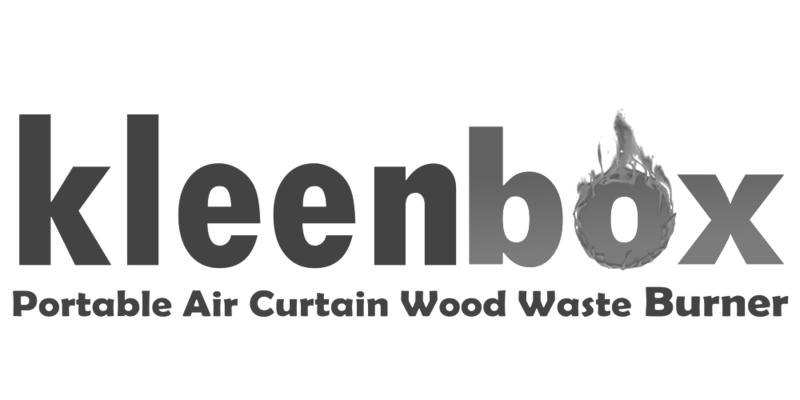 The primary objective of an air curtain machine is to reduce smoke particles, which results from burning clean wood waste. Using a Kleenbox air burner, the smoke is trapped and reburned. The picture to the right shows two Air Burner machines completely full and burning, while in the background, a pile of wood is open burned. The same amount of wood, 20 tons, was used at each of the two sites. The FireBoxes eliminated the 20 tons of waste wood in one hour. The open pile burned for more than 48 hours to handle the same amount of waste wood. The bottom picture is an aerial view of this site. It shows the environmental impact of open burning versus air curtain burning. Burning onsite eliminates the need for grinders and trucks. Plus, it is much faster, saving money and protecting the environment. The primary purpose of a kleenbox Burner is pollution control; in particular, the reduction of smoke from open burning. The high velocity air curtain traps the smoke particles momentarily causing them to re-burn and be further reduced. The air then continues in to the firebox or trench to agitate and oxygenate the fire. The result is a burn that is cleaner and faster than open burning.